I currently work with my clients not just as their accountant, but also as their financial “coach,” guiding them to make intelligent decisions and keeping them focused on their long-term financial goals. It is an honor to answer any and all financial questions my clients have because I understand the responsibilities I have taken on as their trusted advisor. I believe in the importance of education. I inform my clients about their current situations by telling them exactly what needs to be done and how by providing them with information on specific strategies and products. By taking my approach, it gives me the utmost joy to see my clients make expert decisions on whether to invest in a product and how that product may fit in their comprehensive financial plans. They are more focused on their long-term goals without fear of getting distracted by volatile market conditions. The foundation of my success has been my unique approach. I do not chase winners, rather I implement strategies to control the wastage in the form of taxes, to manage debt, and by reducing or eliminating risk. I have implemented various simple and complex strategies in the subfields of Income tax, Retirement, Risk management, Asset Accumulation – Preservation and Distribution Planning for all types of individual and business situations for my clients. Please contact me or my team members with any questions you might have regarding your current financial situation. Join us and let us lend you a hand on your financial life cycle journey. Together we can achieve even greater success. *Financial Planning is offered by Vishaw Sondhi who is a a Registered Representative and Investment Adviser Representative of Equity Services, Inc. offering securities in New Jersey and New York. 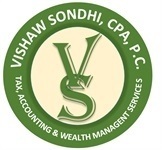 Vishaw Sondhi, CPA and all other entities and individuals are independent of Equity Services, Inc.
Vishaw Sondhi is insurance licensed in New Jersey.